In analogy with a mechanical clockwork, an optical clockwork is a device which phase-coherently relates a high and a low frequency and can serve as a central ingredient of an optical clock. The higher frequency is an optical frequency, i.e., typically in the range of hundreds of terahertz, whereas the lower frequency is typically in the microwave region (e.g. between 1 and 100 GHz), so that it can be processed with fast electronics and easily related to even lower frequencies. An optical clockwork can thus relate an optical frequency standard to an electronic one, the latter being based on, e.g., a cesium atomic clock. Early optical clockworks have been frequency chains, which involved a complicated combination of many nonlinear stages. Each of these stages related some frequency to a certain multiple of that frequency, often just two times the lower frequency, or with some known frequency offset. Such frequency chains were extremely difficult and expensive to set up. 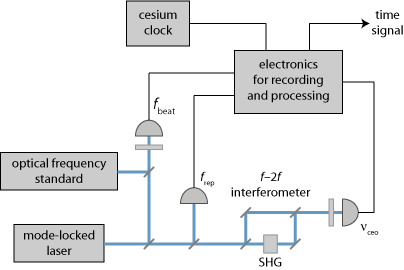 Figure 1: Schematic setup of an optical clock, containing an optical clockwork based on a frequency comb. The clockwork serves to compare the optical and microwave frequency, and thus to transfer the superior long-term stability of the optical standard to the electronic time signal. The advent of very broadband mode-locked lasers has made it possible to realize by far simpler optical clockworks, as the output of such a laser is a frequency comb, where all frequencies occurring are determined by just two parameters: the pulse repetition frequency and the carrier–envelope offset frequency. An optical frequency from some frequency standard (e.g. a single ion in a Paul trap) can then be expressed by the sum of the carrier–envelope offset frequency, a certain integer multiple of the pulse repetition frequency, and a beat note frequency, which can all be measured and processed with fast electronics. It is thus possible to phase-coherently compare the frequencies of the optical standard and a cesium clock and correct the timing signal of the latter, using the superior stability of the optical frequency standard. Figure 1 shows the setup of an optical clock which can be realized in that way. 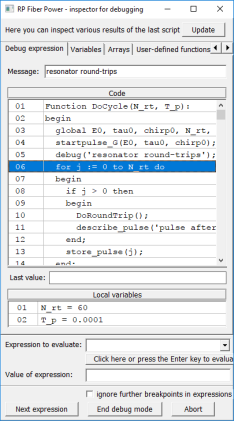 Note that the frequency comb does not necessarily have to be stabilized itself to fulfill its function . See the articles on frequency metrology and frequency combs for more details.